If doing a product demo FEELS easy and intuitive, watch out. Even if you have lots of product knowledge, doing a product demo persuasively is hard and counterintuitive. I mean that what feels right during a product demo usually causes failure. For example, it probably feels right and intuitive to do a “ramp up” product demo. That’s when you start your demo from the ground up, build anticipation, and do a “grand finale” at the end,. For most people, that seems like the right way to approach a product demo. But that approach causes friction in your deal. In this post, I’m going to teach you 7 tactics that will make your product demo devilishly persuasive. We analyzed 3,000,000 web-based product demos using AI to understand which behaviors sell. Analyzing that many product demos is the best way to find patterns, which is where the best tips and tricks hide. The meetings were all recorded on web conferencing platforms like Zoom, then transcribed and speaker separated. 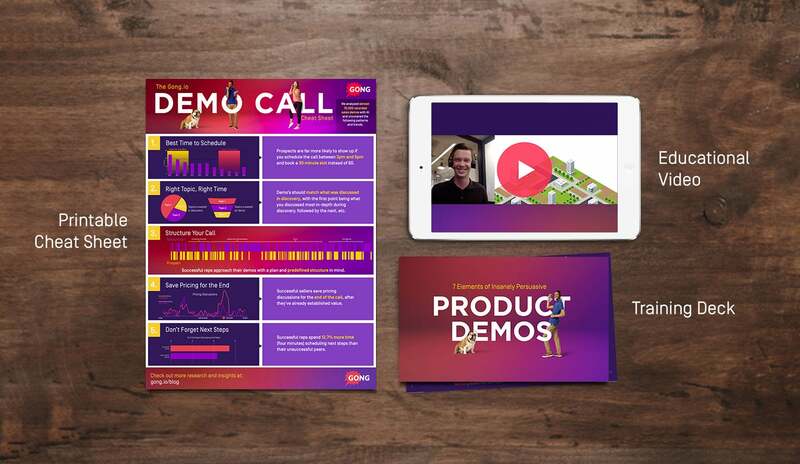 There are 7 ways to do an insanely persuasive product demo. As I said, what feels intuitive during product demos can cause you to lose deals. Pretend you’re a sales rep pitching a politician on building a new city on top of an empty plot of land in South Dakota. It doesn’t look like much, I know. BUT JUST YOU WAIT! In a couple of years, we’ll have roads, sidewalks, and trees. HECK! Maybe we’ll even have a stoplight! But we’re not stopping there! No, no, no! We’re going to keep developing and building. I can SMELL the progress! By year 10 or so, we’re going to have a thriving, BEAUTIFUL new city! The seller thought it was best to build anticipation and lead up to a grand finale. But Mr. Politician is busy, and it took 20 minutes to get to that one point. All the while he was impatient and frustrated, waiting for the rep to make a point. Meanwhile, a competitor stole the deal by flipping the entire product demo upside down. I’m happy to walk you through the plans in as much or as little detail as you’re interested in. The first product demo was all lead up. The second pitch started with the outcome, letting the conversation unfold from there. We found this pattern in the successful calls we analyzed. Winning product demos mirror the same priorities raised during discovery calls, in priority order. In other words, start your product demo with the problem you spent the most time on during discovery. Then move to the business problem you spent the second most time on during discovery. This is approach is called “solution mapping” and it helps you get straight to the point. Most salespeople do the opposite, saving the best for last (all the while believing that’s what will work). Solution mapping is counterintuitive, but that’s what works in product demos. Understand that and everything changes. Sure, you love your product. You believe in it and could talk about it all day. Most people tell their buyer everything amazing they know about their product. This is a result of being too heavy on product training and not heavy enough on sales training. Even if you’re “talking value” (rather than features), most sales reps still cover too much ground, believing that the MORE they show, the MORE value they build. It’s a misguided approach that can sabotage your deal. We’ve found it’s much more effective to do concentrated product demos. That means you’ll keep your talk short and punchy, sticking to a 9-minute rule for your main demo. You’ll also spend far less time talking about features — 39% less, in fact. Why? Because if you say less about features, your buyer has room to ask questions during your product demo. And top sellers know that’s a good thing. In fact, their buyers ask 28% more questions than buyers in average reps’ product demos. Questions are a good sign you’ve interested your buyer (and that you haven’t bombarded them with too much). Their heads are spinning (in the right way). You’ve teased them and they want to know more. We call this ‘peeling back the onion’ during your product demo. YOU don’t decide how much detail to give during your product demo. Let your buyer decide if they want a 30,000 foot view or the details on every nook and cranny. That’s like watering down top-shelf whiskey before serving it to an important guest. No one wants diluted seconds. Buyers want a top-of-the-line pour. Hand them a great product and give them a small taste of it. If they’re qualified, they’ll want more. It’s so tempting to focus on your product’s benefits during a demo. They’re positive and easy to talk about. But remember: what feels intuitive during product demos is rarely what works. Focusing your message on the pain of the status quo is more persuasive than focusing on benefits. If your buyer believes the status quo is no longer an option, they’re a step closer to investing in a new resource. So how do you blow up the status quo? In a word, using the behavioral economics principle of loss aversion. It’s the principle that people go to greater lengths to avoid losses than they do to gain benefits. If your buyer believes that “status quo = more pain” they’ll run toward your solution faster than they would if you pained a vision of the benefits. In fact, they’ll run twice as hard. During your product demo, be clear about the dangers of the status quo. Show your buyer that their current state is unsustainable, and they’ll be willing to move away from it ASAP. Think of it this way: It’s easier to convince someone to move away from a fire than to get them to move from a chair to a comfy sofa. People are more motivated to NOT lose $25,000 they already have than they are motivated to earn an extra $25,000. Use this psychological bias to your advantage. Your close rates will bump up if you do it right. Preparation is critical before a product demo. You want to have great answers to every tough question under the sun. That said, solid answers alone won’t let you control the conversation’s direction. And why is that control important? Because timing is everything. You want to answer certain questions at specific points in the conversation. It turns out the best reps control when certain topics are discussed. When’s the best time to discuss pricing? Whenever your buyer raises the issue? It’s toward the end of the call, after you’ve established value. By then, the buyer is “sold,” which makes them more likely to justify your pricing. If you let them steer the conversation toward pricing early on, your chances of success drop. And there’s one other part of the discussion you’ll want to steer with a strong arm: objection handling. Hearing buyers’ objections can throw some people off their game. They panic over the unexpected conversational redirect. Here’s our best tip for avoiding that scenario and staying in control. Respond to objections by asking questions. The top reps did that 54.3% of the time when they heard an objection, compared with 31% for average sales reps. It makes the buyer feel heard. It gets your buyer to reveal their real pain point, which helps you address their objection. If you can stay in control of the conversation without being domineering, you’ll win. Social proof seems like an easy win, but it’s the opposite of your BFF during product demos. Using endorsements from big customers might win credibility with a few buyers, but chances are it’s going to work against you. It alienates most potential buyers. Sellers who use social proof techniques during sales calls have a 22% lower close rate. You’d think that name dropping a big customers would persuade buyers. Simple: Most buyers won’t identify with big-name players. If your product is perfect for the likes of Google or Apple, for example, then how could it be right for an SMB buyer? They face completely different problems. Buyers want to see themselves in a product, and they can’t do that if you keep citing A-listers. Instead of naming a few big customer names, rattle off 5-7 names of customers that are from your buyer’s tribe — other companies in their industry, operating at their level. Be sure the problems you solved for those clients match your buyer’s pain points. Attempting to prove ROI during your product demo can be just as damaging as using social proof. In general, attempting to prove ROI at any point in the sales process correlates with a 27% drop in your likelihood of closing a deal. You read that right. Most attempts to show a customer how they can get an ROI from your product strongly correlate with deals going south. When you show a buyer how you calculated their ROI, they’ll challenge your assumptions. They’ll see your calculation as a weak argument unworthy of presenting to their CFO. When you build your business case with before-and-after customer stories, you’re bullet proof. There are no ROI model assumptions for your buyer to argue with. You’re simply telling a story of what one of your customers achieved. There’s a hidden opportunity in here for you as well. That’s not what you want to do here. Focus instead on the problem the client faced, and be sure it resonates with the buyer. If your story describes their problem better than they can describe it, they will assume you have the best solution. You won’t have to do much more than that. The buyer will do the rest of the work for you, moving toward a sale on their own. Want to close your deal faster than ever? Spend 53% more time talking about next steps at the end of your product demo. And the tip that surprises everyone? Talk about next steps during your first call for a huge win. Take that number in for a minute. Securing next steps during a first call is the easiest sales cycle decreaser ever. The secret to making sure you solidify those next steps? Get agreement from your customer at the BEGINNING of the call to discuss next steps, rather than penciling them in at the last minute. That one sales tip will ensure you spend enough time getting next steps. Start every meeting that way. Your product demo dictates your deal’s trajectory.